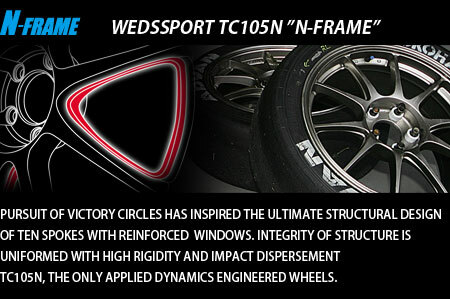 WedsSport TC105N design is derived directly from the Super GT-Racing program. The 10 Spokes design with Weds innovative and exclusive “N-Frame” reinforced engineering design that makes the TC105N a very lightweight, rigid and strong wheel. This can only be achieved by combinations of design, high quality material and our AMF (Advance Metal Forming) manufacturing process. The N Frame Technology Concept requires combinations of in-depth understanding of material property, geometry, and manufacturing technique. Each rim size, rim face contour with the N-FRAME is strategically applied to increase the strength of the rim and its performance. Widely used in various forms of motor sport disciplines. Wide range of sizes and offset. TC-105N is designed to accommodate many big-brake kits on the market. Weds’s Advanced Metal Forming (AMF), better known as flow form or rotary/spin forging is a unique process where a machine called a CNC lathe is used to form a metal object; in WedsSport’s case, this metal object is a wheel barrel. For WedsSport AMF, low-pressure casting is used to create the wheel face and unshaped barrel. A roller arm on top of the barrel shapes the barrel by using a rim mold underneath the barrel (Refer to the image below). The high pressure created by the roller and the rim mold creates an extremely dense aluminum structure. The benefit of AMF is that it uses a cost effective method to achieve very high strength along the rim barrel. Using AMF, it is possible to achieve a wheel strength which is almost as strong as forged wheels at a fraction of the cost. 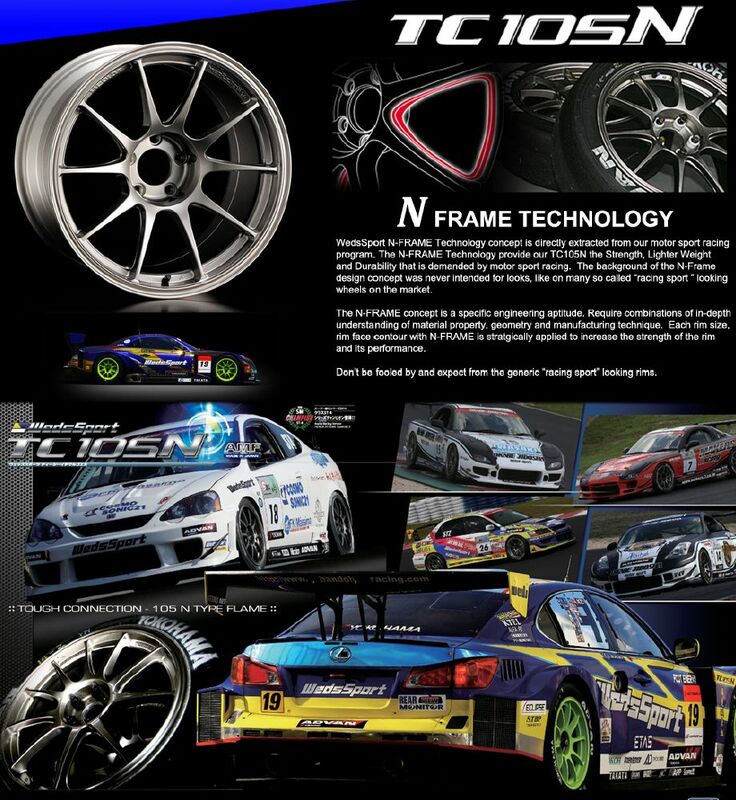 An example of flow-form in motorsport applications is O.Z.’s produced Formula 1 wheels and Tilton Racing’s WTAC Mitsubishi Lancer Evolution IX featuring the WedsSport TC105N. Be the first to review “WedsSport TC 105N” Click here to cancel reply.